The presidential office said Friday it will consider revising regulations to exclude dogs from the list of livestock. Choi Jae-kwan, senior presidential secretary for agricultural and fishery affairs, made the remark during a broadcast aired on the top office's social media page. 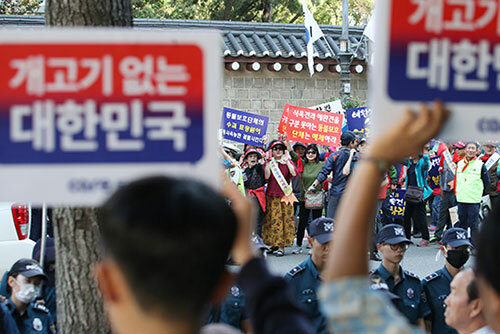 The remarks came in response to a public petition posted on the presidential office's Web site calling for removing dogs from the list of livestock under domestic law and banning dog slaughter and consumption of dog meat. The secretary said the government will consider revising related regulations so dogs may be removed from the livestock list, but prohibiting the consumption of dog meat may require more time and discussions. He cited a recent survey showing that over 51 percent of respondents opposed the consumption of dog meat and about 40 percent were in favor, adding the livelihoods of people engaged in the industry must also be considered.